Today was my monthly weigh-in with my trainer, and guess what? I lost seven pounds in the past month! My trainer tasked me with logging my food intake each day, which has been extremely eye-opening. The “healthy” smoothie I made for breakfast each morning? Yeah, that baby was over 1000 calories. 😳 The container of homemade trail mix wasn’t terrible…but eating it all in one sitting was. It was OOC–out of control. So lately, I’ve been working on eating more protein-rich, fiber-rich foods to stay fuller longer. Portion control has been a big focus as well. In the beginning it was really tedious and frustrating to log everything I ate (and honestly sometimes it still is). But lately I’ve been trying to think of it as an asset instead of an inconvenience. If this is something that keeps me on the right track, I need to do it. I don’t just want to lose weight–I want to be healthy. I originally wanted to lose 30 pounds before my 30th birthday, but I’m altering that body goal. I want to be healthy. I want to be fit. I want to make good food choices. And I feel like those are goals that are worth working toward. Day 80: Surviving makes me happy. This was my sixth day in a row of teaching customer class and my voice started going out. I was able to get through my class anyway though–sometimes you just have to be happy you made it through. Day 81: Buying snacks makes me happy. For our upcoming family vacation (more on that below) I was in charge of buying the snacks. Who doesn’t like buying snacks?!? The hardest part was trying not to eat them before the trip (and remembering to load everything into the car). For the record, I did try to buy healthier snacks…but some s’more ingredients may or may not have made their way into the cart too. Day 82: Fridays make me happy. Especially Fridays before a long weekend! Days 83-87: Family vacations make me happy. 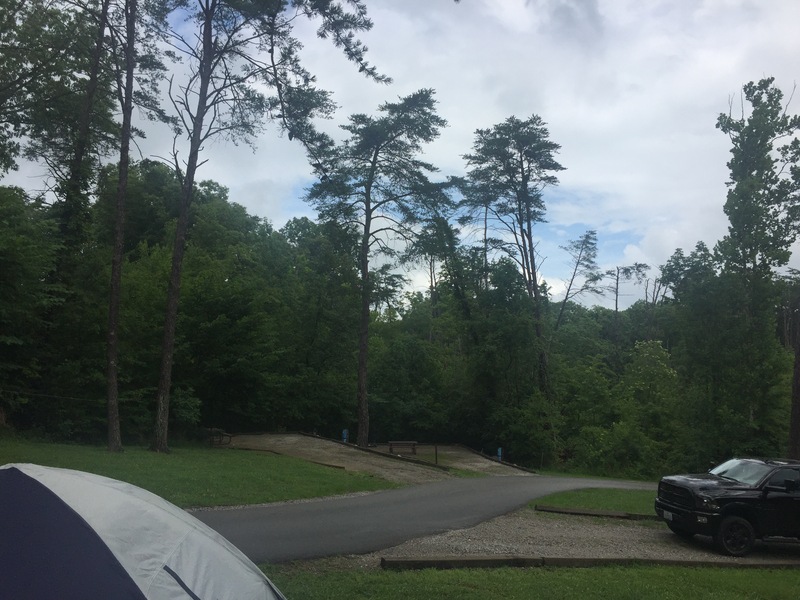 My family and I camped near Mammoth Cave for the holiday and it was really fun! We had the most awesome RV in the park (and that’s not me bragging–people came by multiple times a day to compliment it). We hiked a trail near the cave, which was somewhat challenging in 90° weather with 1,000,000% humidity. But we made it–and rewarded ourselves with great food and lots of laughs. Check out the view from our campsite and my new friend Belle below! Victory (a.k.a. the baddest RV in the park). Belle! She protected us by barking at everyone who walked past our campsite. Days 88-89: Short work weeks make me happy. That’s the awesome thing about coming back to work on Thursday–you’re already basically at the weekend! Is it bad that I’m already counting down the hours until the weekend officially starts? These are usually the first words I hear from my step kids every day. They can’t wait to get a bowlful of some sugary concoction first thing in the morning. Cocoa Puffs, Fruity Pebbles, Reese Puffs, and Frosted Flakes are some of their favorites, but they don’t discriminate too much. When I was a kid, I ate my fair share of breakfast cereal–heck, I’ll still have a bowl every now and again for a snack. But I want the first thing my kiddos eat to be real food, not artificially colored sugary nothing. So today we did something different! I sliced and toasted two whole wheat bagels, spread one half with peanut butter and the other with Nutella, then cut the halves in half (necessary for little fingers). I sliced two apples and gave each boy four slices along with half a bagel (one peanut butter piece and one Nutella piece). A glass of orange juice and we’re done! The older boys gobbled it all up; the youngest ate the bagel and most of the apple slices. They loved that they could make a “sandwich” with the two bagel pieces and use the apple slices to scoop up the peanut butter and Nutella from their plates. I loved that they got a bit of protein, some vitamins, and a meal that would really fill them up. I ate the same portion size as them and I even I got good and full! What are some kid-friendly recipes you’ve made to keep the little ones full and happy?